Winter nights can be made memorable with friends and family not only at home but in the cool air outside too with a good Patio Heater. Cuddle up on swings and couches in your garden or on the porch watching the snow fall with the Patio Heater keeping you warm. 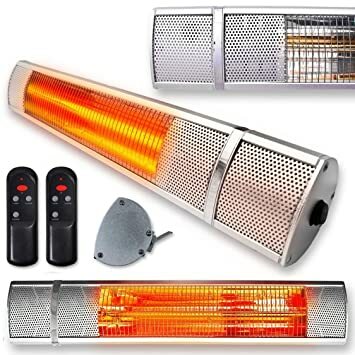 These heaters are usually in a lamp shape with a heavy bottom to balance the long narrow middle section and a mushroom at the top to distribute the heat. The top is usually adjustable to 45 degrees up or down. The length too is adjustable and they come with tilt detection systems which turns off the gas in case the lamp is falling down. While these Patio heaters are highly portable, they can become cumbersome for places with lots of people and are rather more suited to open places with few people like in your porch or garage. Their heating range is usually 15-20 meters squares and the gas ones operate at 40,000 BTUs. These heaters are not portable and make for a permanent installation. So you have to choose carefully where to use it and even during the summer seasons, it is not easy to store them away. Mounted Patio heaters are mostly electric and are ideal for close places where it is not possible to give space to a standing Patio heater which somebody might topple. Its heating capacity varies between 10,000 to 30,000 BTUs but their heating direction can be more accurately directed than standing Patio heaters. Quite similar to Mounted Patio heaters, these are mostly electric and require a permanent installation like a ceiling fan. These are ideal for small places and have a wide range of heating with usually no way to direct the heat in a particular direction. They also produce heat between 10,000 to 30,000 BTUs. These are most portable Patio heaters that come in both electric and gas based variants. Great for dinner gatherings or house parties. These are small and easy to assemble or disband as per your requirement. They produce a maximum of 30,000 BTUs heat. Electric – These Patio heaters are energy efficient zero emission appliances available in all design types. You can use them anywhere where you can get an electricity connection. They come with Quartz heating tube and are quick to heat up and provide glow in addition to heat. Natural Gas – These heaters require professional installation and are connected to a direct gas pipeline making their installation permanent. These are eco-friendly options and produce no harmful emission. Though the installation requires professional help to prevent any gas leakages, they have almost zero maintenance costs and the only cost you have to pay is for the gas used. Propane/Butane – These are the costliest Patio heaters due to the constant requirement of refilling the Propane fuel. However, they are highly portable, very easy to use and you can assemble and operate it on your own without the need of any professional help. When not in use, the fuel has to be removed and properly stored for safety purpose. The usually come with the tilt detection system to close of the fuel valve in case the Patio is bent at more than a certain angle. They also come with an automatic shut off for the fuel if ignition fails. In case of liquid or gaseous based fuel, check for automatic shut off by tilt detection and failure of ignition. Analyze your usage properly based on the number of people and sitting location. If planning a dinner party around a table, a table top Patio heater or a hanging Patio heater would be ideal. For a big party, two standing Patio heaters on either side of the table are a good choice. If you are going to sit on your porch during a winter night a wall mounted or standing Patio heaters are a good choice. In small places like a garage with your car already occupying a large space, a wall-mounted Patio makes sense. For parties, it is a good idea to keep portability of the Patio heater is mind too. In case of an electric Patio heater, the heating tube has a limited lifespan. Make sure to check if replacement of the Quartz heating tube is easily available or not from the manufacturer. Standing Patio heaters generate more BTUs compared to other types of Patio heaters but they need to be placed close to the sitting place to take advantage of it. BTU (British Thermal Unit) measures the heat energy in fuels. It is defined as the amount of energy to increase the temperature of 1 pound of water by 1 degree Fahrenheit. Most standing heater produces around 40,000 BTUs, while a smaller tabletop heater generates 12,000 BTUs. In general, higher the BTU the higher the heat output and larger the area in can cover. Choose the right size heating unit that balances between power and space size. 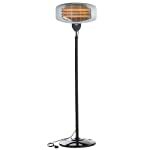 VonHaus Electric Patio Heater is a free-standing weatherproof heater that heats up instantly and provides warmth in the area up to 15m2. It provides heat through its Quartz tube heating element and comes with 3 heat settings – 650W, 1350W & 2000W. The lamp can last up to 2500 hours of heating. It can be used both indoors and outdoors and its weatherproof rating is IPX4 which means quite a high level of weather resistance. However, it is not a bad idea to protect it from nature if possible. And if anything does happen to it, you can get it repaired free of cost with its 2 years manufacturer warranty. Its physical dimensions are 47 cm x 50 cm x 2.1 m. The heating element height can be adjusted 45 degrees up or down to direct the heat and light exactly where you want to. Similarly, you can adjust its height to 174.5 cm – 210 cm. The 3-meter wire makes it easy to keep it at a place you like while still being able to connect it directly to the power supply without the need of an extension. 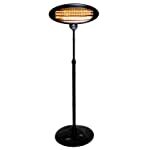 This electric Patio heater is quite energy efficient and you will notice very little difference in your electricity bill. 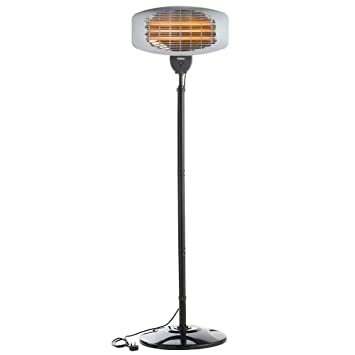 Wall mounted Patio heater from Futura is one of the best Patio heaters for parties or places where there are a lot of people and you don’t want anyone tumbling due to a vertical stand based heater. This Patio heater comes with 3 heating range – 750W, 1000W and 2000W and its physical dimensions are 630 x 150 x 120mm. You can use this stylish Patio Heater in restaurants, garage, gazebos, garden, balcony and practically any place where you have a wall to mount it and a power connection to connect it. Futura Patio Heater comes with a remote control. Its power consumption has been measured to cost just 25p per hour which is a highly efficient energy consumption. It heats up an area of approximately 20m2 and comes with a 2-year warranty. Along with the heater you also get a pivot to adjust the direction of heat flow. Futura has a great customer service and in case of any fault in the product or delivery like missing remote, you just need to email them and expect their response within 1 working day. The heating even at the lower levels are sufficient for a small group of people and you will only feel the need to turn it up to full if you are hosting a party or a big family meet. 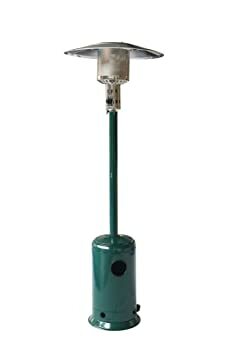 Oypla branded Patio heater is a CE/https://images-na.ssl-images-amazon.com/images/I/61mAdSPJNdL._SL1500_.jpgGS Certified & ROHS Certified vertical stand based Patio Heater. It has a Quartz tube heating element with an automatic overheating safety protection. It runs on 3 adjustable heating power levels – 650W/1350W/2000W. It has a heavy base to provide extra stability to its vertical structure without being too heavy that you can’t lift it up and place it in the garage when not in use. It has a beautiful design which makes it ideal for both domestic and commercial use. The height is adjustable (174.5 – 210 cm) and in addition to the heat it also gives off a glow making other lightening unnecessary if you are just sitting on the porch outside having your wine and watching stars. The width and depth of the Patio heater are 50 cm and 47 cm respectively. It is fitted with a UK British Standard BS Approved 240V Mains 3 Pin Plug along with a 2-meter wire. The heating element can be adjusted 45 degrees up or down so that you can customize your heat flow direction. It is simple to assemble once you get it and the Quartz heating tube has a life of 5000 hours. Though this Patio heater is rated IPX4 and is weather-proof, it is a good idea to not let it actually leave in rain or storm. You might face some difficulty getting spare infrared heating tubes for it so use it carefully. If electric Patio heater is not your thing, then let me introduce you to the good old gas based Patio Heater. Gas based Patio heaters like this one are primarily for outdoor use due to safety reasons. It is coated with green coloured powder coating and runs on propane or butane fuel. It gives off a maximum of 8.5kW of heat and can be used year round. Without a cord to limits its mobility, this heater can be taken anywhere. The fuel is burned through a glass bottle placed at the base of the Patio. There is no cylinder with the Patio heater and one needs to buy the cylinder and a regulator separately. There is a stainless steel top that distributes the heat in 360 degrees. The gas Patio heater from Firefly has been made keeping your safety as the first priority. In case something does go wrong like the Patio tilting and falling or the flame going off suddenly due to some reason, there are enough checks in place that the flame does not spread nor is there any form of gas leak. With its tilt detection feature, any tilt in its posture which might lead to it falling on the ground, the flame is automatically cut off. Similarly, in case the gas fails to ignite when switched on, the gas is automatically cut off to prevent any leakage of the gas in the open air. The gas canister is accessible through a side door which you can use to replace the canister or check it for whatever reason required. Since gas Patio heaters are heavy, this Patio heater from Firefly comes with wheels are the bottom making it quite simple to shift it in the garden or from one place in the house to another. It comes with a free fire hose and regulator, all you need to get is the fuel. It heats up an area of 19.6m² and the heat output is equal to 12kW. It consumes 2800g gas per hour at maximum heat. 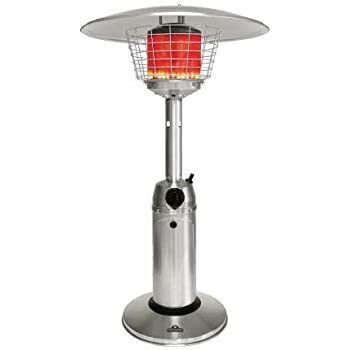 Since the complete Patio heater is made of stainless steel, the whole body gets quite hot after some time of use. So take care that nobody touches its body while it is ON and even after switching it OFF, give it sufficient time to cool down before trying to move it. While assembling it might take some effort connecting the hose to the heater.